Budapest, Hungary, is known as the Pearl on the Danube and that name is well deserved! This beautiful city is packed with history, culture, and most importantly, Hungarian food. Split by the flowing river Danube, Buda and Pest (Budapest) offer visitors an array of things to do. 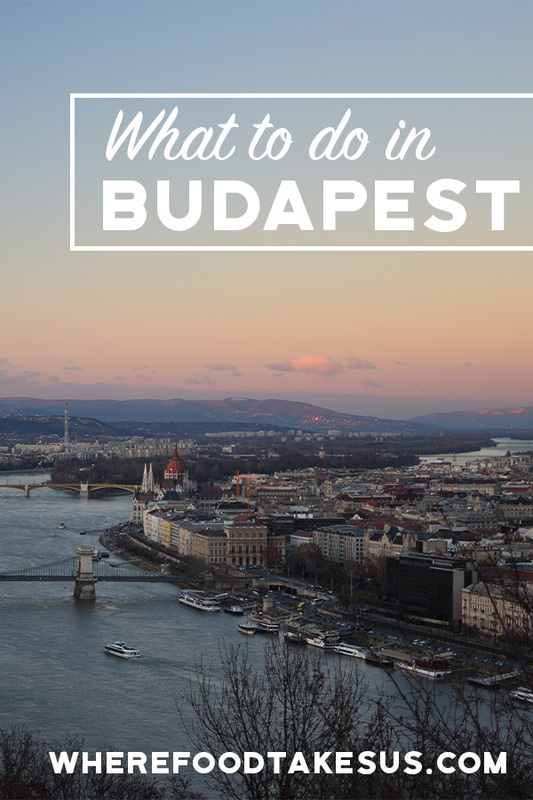 We’ve compiled a list of our favorite things below and we hope it serves as a useful guide for what to do in Budapest. A free walking tour is the perfect prelude to any adventure and we highly recommend checking these out. We went on the general free walking tour, Jewish Quarter tour and communism tour. All three tours were spectacular and well worth your time. Not only do you get a sense of direction around Budapest but you also get information and tips from the local guide taking you around the city. There are other tours available as well. You can check it all out on the free walking tour website. One of the most iconic buildings in Budapest, it’s the only building that shares the same height with parliament (96 meters). 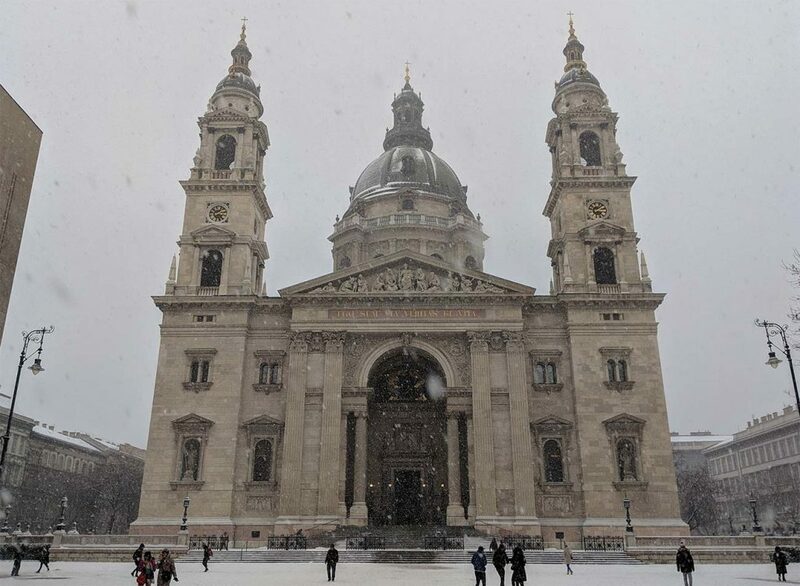 Our visit to St. Stephen’s Basilica was made even more special by the snowfall. 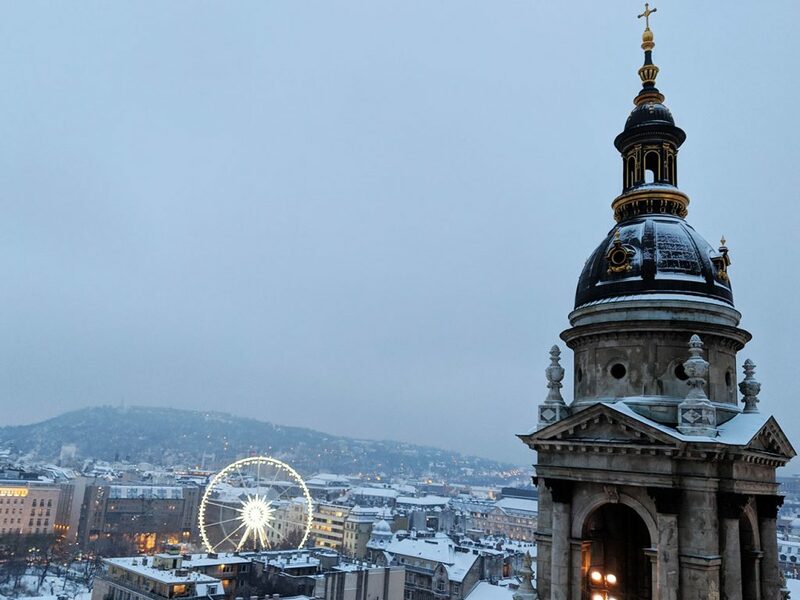 You can read more about our visit, as well as how to get to the top for some great views, in our post on St. Stephen’s Basilica. 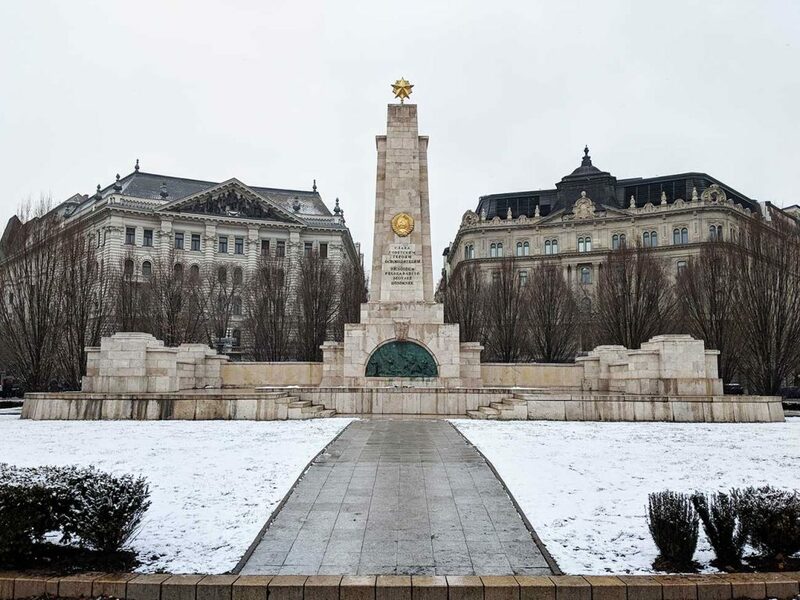 One of the most famous spots in all of Budapest, Heroes’ Square is a lovely walk, even in January’s bitter cold. We envy you if you visit in the summer. The square was built to commemorate Hungary’s 1000th year, 1896. However, with regimes changing several times since then, statues have changed over time as well. That said, it was reconstructed after WWII and is now a landmark site in Budapest. 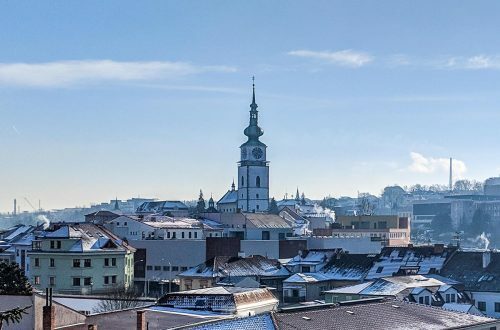 Walk further into City Park and enjoy ice skating and the beautiful Vajdahunyad Castle. Venture even further and you’ll find Széchenyi Thermal Bath. This is a beautiful area of Budapest. 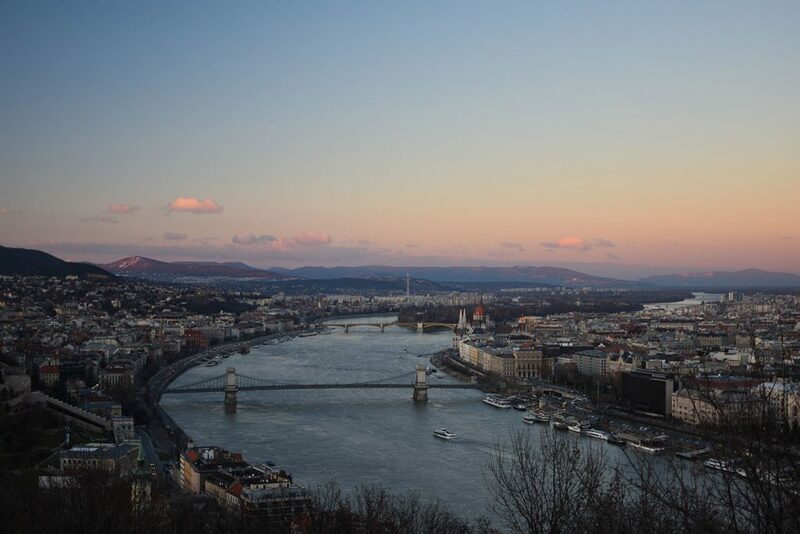 Take a trek across Liberty Bridge and head up Gellért Hill. The lady liberty of Budapest is waiting for you at the top and there are amazing views as well. Try to time your visit around sunset for an even richer experience. 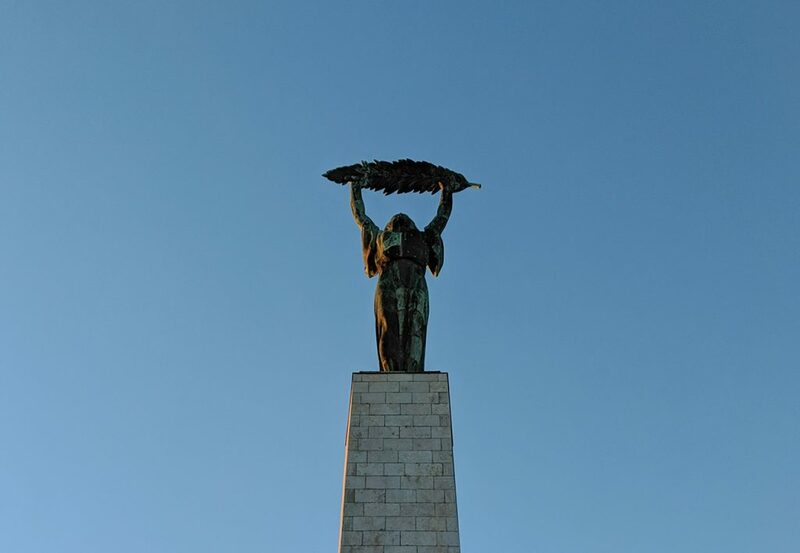 See how our time went (it was awesome) in our post on Gellért Hill and Liberty Statue. 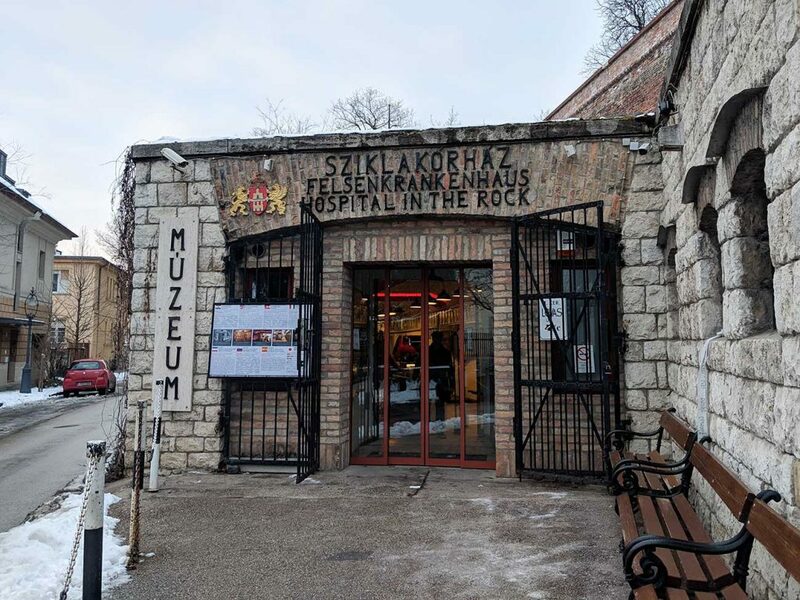 The Hospital in the Rock is a lesser known gem in Buda Castle but it’s a fantastic museum that any fan of history will enjoy. Literally located “in the rock”, the museum served as a hospital during WWII and then as a nuclear bunker during the communist regime. 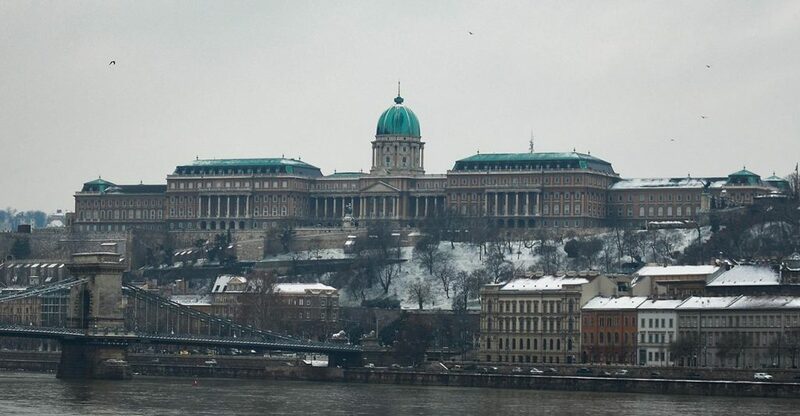 There are caves spanning miles under Buda Castle and the Hospital in the Rock was built within parts of these caves. The tour takes you back in time as you pass through decorated rooms with wax figures to represent the past. This museum surprised us a bit as we weren’t sure what to expect and we’d hate to spoil it for you here. But we’ll say it far exceeded our expectations! If you’re staying in Budapest for a while like we did, or even for a short time, check out the local markets! These are a really great way to do something non-touristy and satisfy your taste buds. A win-win! Our favorite spot was Rákóczi tér Market, but there are others scattered throughout the city. Grab some sausage, cheese, and wine for dirt cheap! 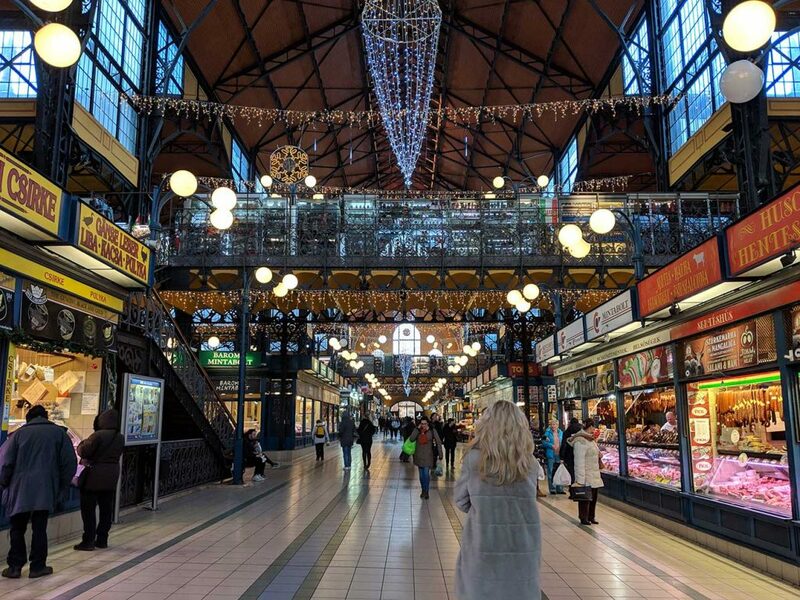 Read about our experience on how to shop like a local in Budapest. 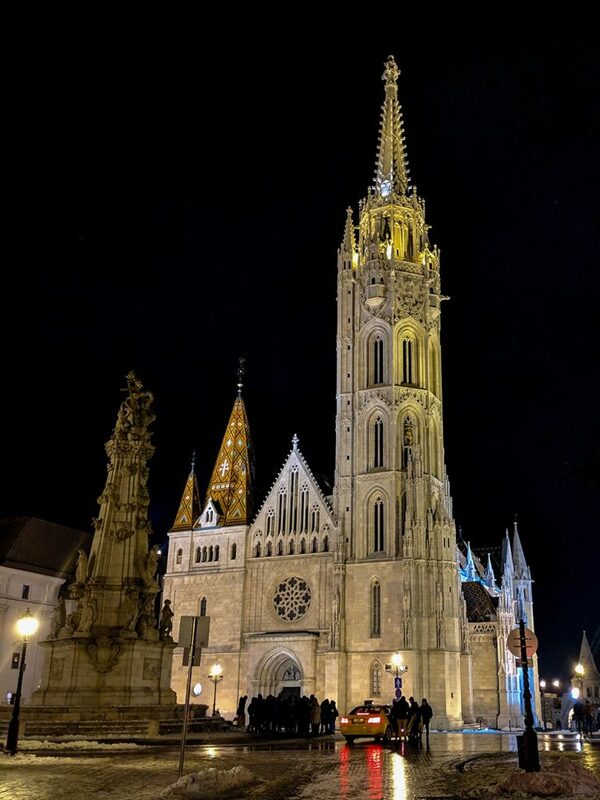 Unlike St. Stephen’s Basilica, Matthias Church is located on the Buda side of the Danube. 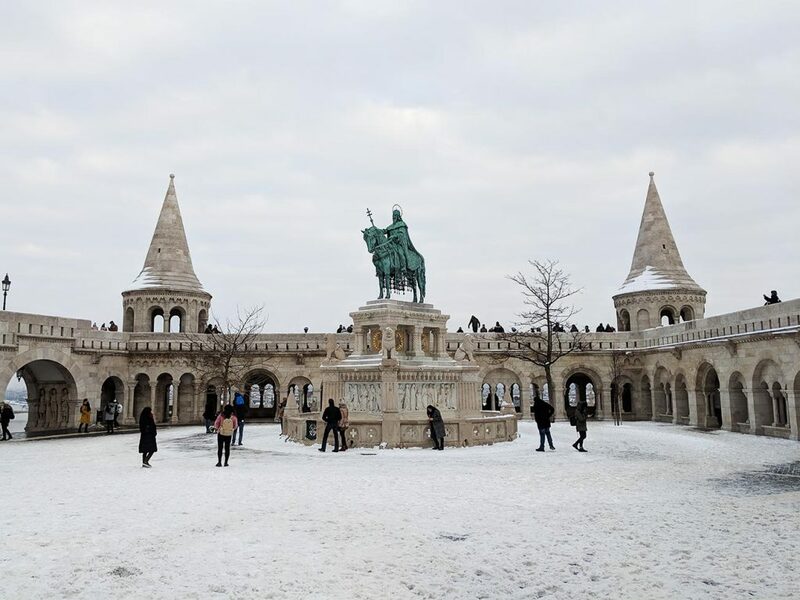 It’s a must-see while exploring Buda Castle. Matthias was an essential figure in Hungarian history and this church has a lot of history within for you to appreciate. Not only is there some sightseeing to be done inside the church but the area outside is also worth a look. Walk around the bastions and appreciate the view of Pest from the Buda side. 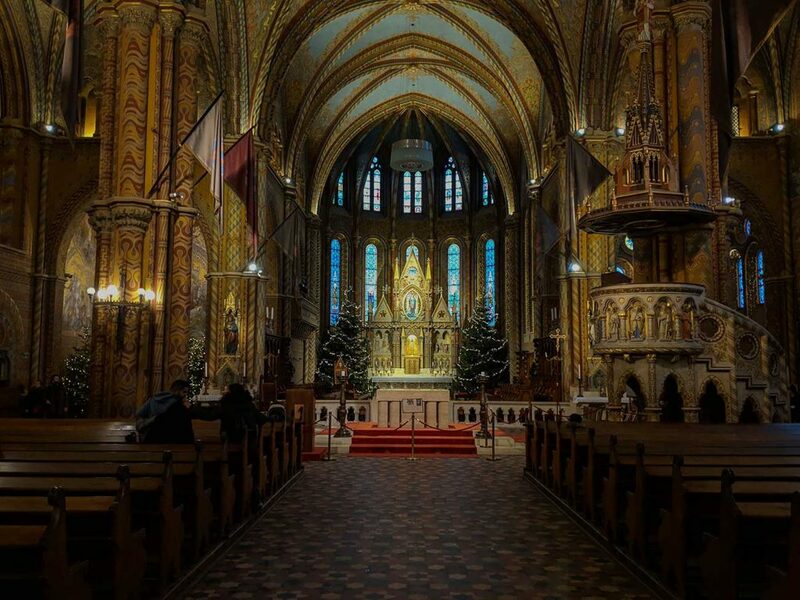 Read more about our experience in our post about Matthias Church. These are now quite famous and have played a big part of the Jewish Quarter’s transformation after the fall of communism. Old warehouses, factories, apartments, whatever, have been turned into places to meet up and eat and drink. 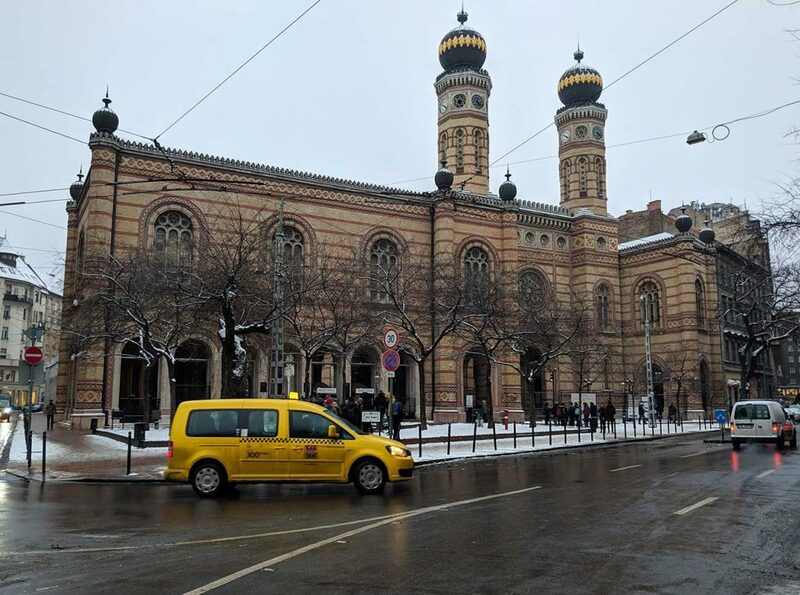 If you take a free walking tour through the Jewish Quarter then you’ll get some recommendations for places to go or you can check out our post on ruin pubs in Budapest. 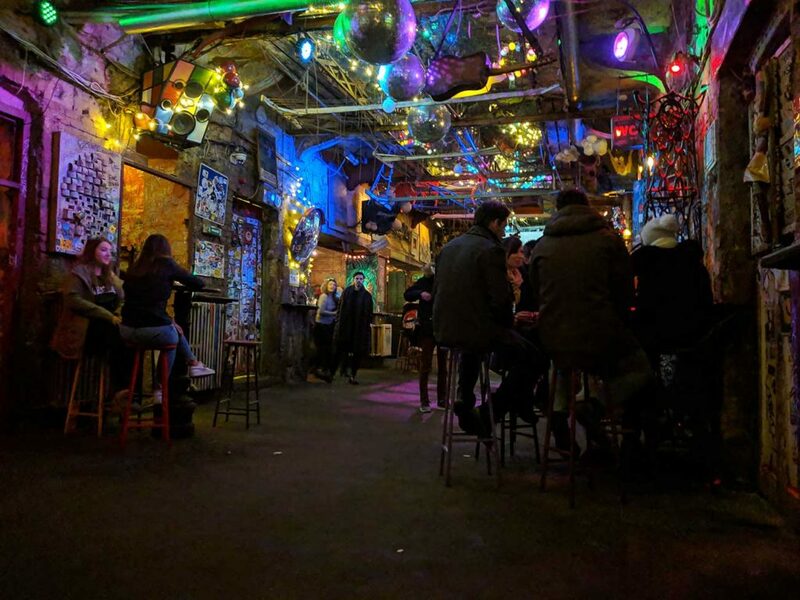 If you’re looking for what to do one evening in Budapest then we highly recommend going to a ruin pub! One of the best museums we’ve ever visited. Enough said. But we’ll say a little more about it. Disclaimer: this museum is not a happy place. That said, it’s important not to forget history. 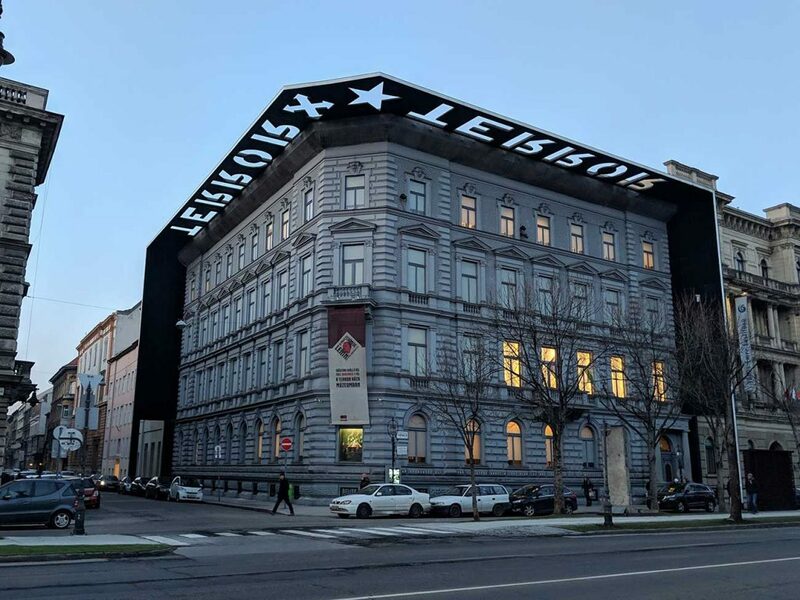 The House of Terror museum is in a building that was used during the communist regime as place to torture and investigate people. The museum itself is so well done and you can spend so much time in just one room. However, pace yourself, because there is a lot to see. Thankfully, there are English handouts so you can get an explanation. From the short Nazi rule to the long reign of communism, Budapest has a dark history but it’s essential to remember it. Located within the most eye-catching building on the Buda side of the Danube, this art gallery is mesmerizing. You definitely want to visit the gallery on a relaxed day because there’s a lot to see and you’ll be pooped by the end. Again, like Matthias Church, not only is the art inside worth your time, but you’ll find lovely views around the building. The building’s architecture is worth appreciating as well. Goulash, anyone? 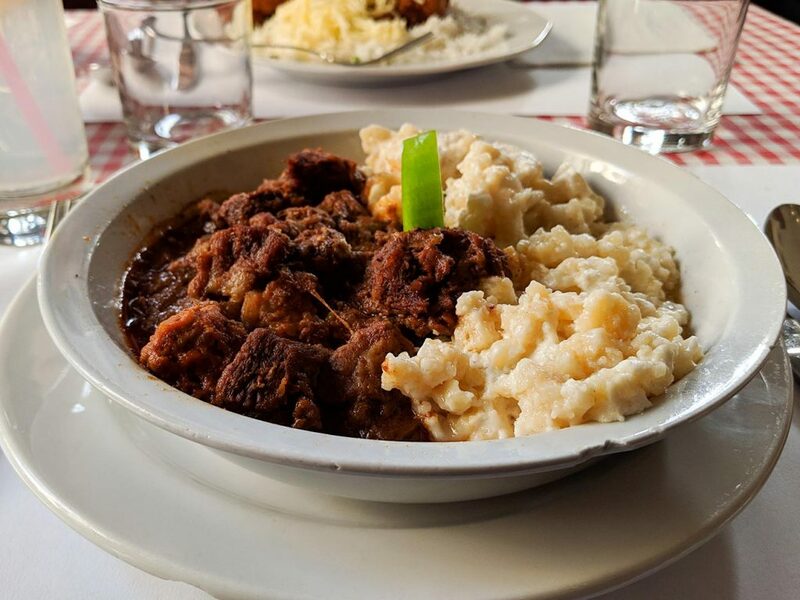 Cheap and absolutely delicious, you must try Hungarian goulash at least once while in Budapest. Pörkölt, paprika, the list of deliciousness in this city goes on. For more tips on where to eat or what food to try, read our post on some great restaurants in Budapest. 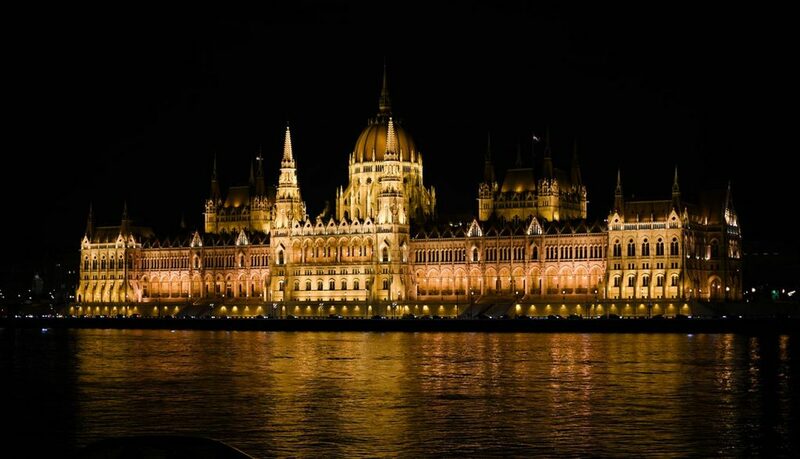 Hungary’s parliament building is stunning, to say the least. Snap a photo of it from across the Danube on the Buda side, or have a look around the grounds on the Pest side and get up close. We saw the parliament building both ways and hope you can do the same. Tours of the interior are offered. However, we did not venture inside. We have heard really great things though so give it a shot! This synagogue is very unique. 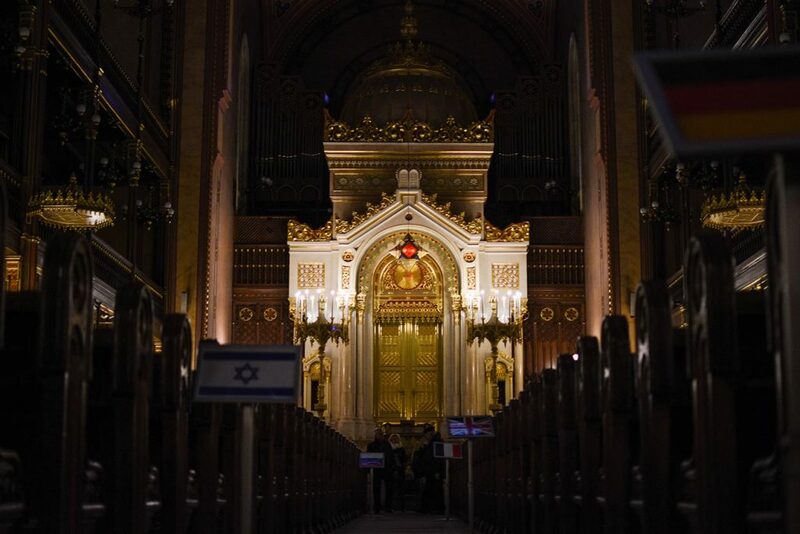 Not only is it the 3rd largest synagogue in the world but its architectural style is unlike most synagogues. There’s a reasoning behind all of it and we hope you’ll visit and find out why. Another worthwhile aspect of this synagogue is its Holocaust memorial. There’s also a fantastic museum within the synagogue with ancient artifacts so be sure to make a visit! 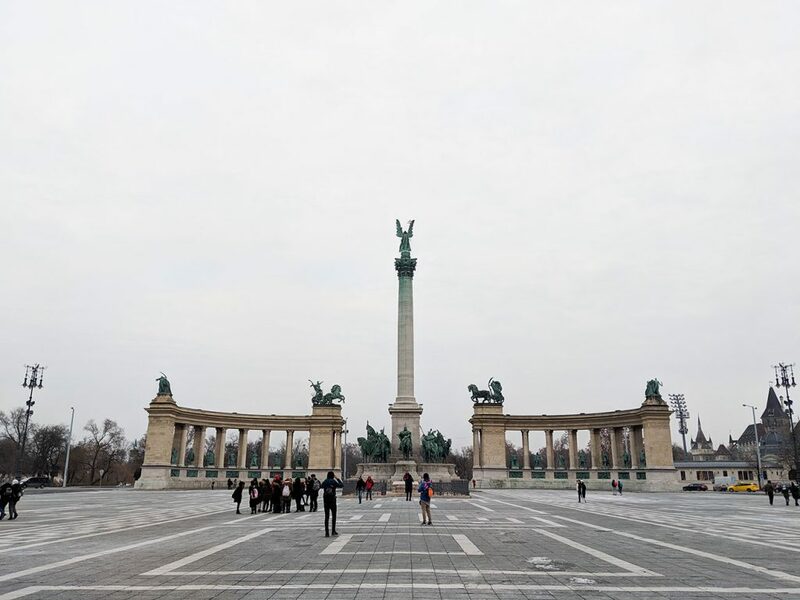 Soviet statues throughout Budapest were removed after the fall of communism. Instead of destroying all of them, some are now kept a little ways outside Budapest in an outdoor museum called Memento Park. Here, you can find the boots of Stalin (all that remains of him), statues of Lenin, and many other interesting pieces of history. There’s also a small theater showing a very cool documentary of how to be an agent in the secret police. Public transportation can easily get you there. 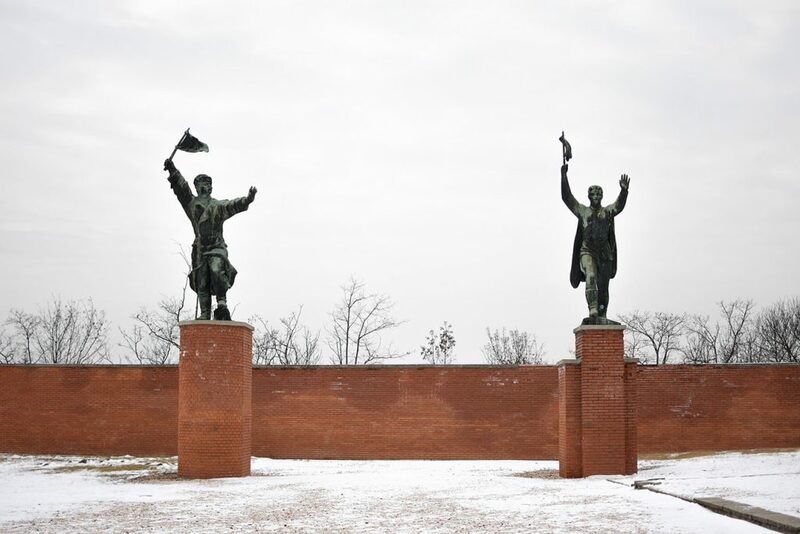 You can read more about it on the Memento Park website. Thermal baths are famous in Budapest. From touristy to the local scene, you can find all types within the city. Széchenyi Thermal Bath is very touristy and quite expensive. Lukács Bath is more local and also less expensive. It depends on your personal taste. Those are just a couple of thermal baths but there are many more. See what’s nearest you or what fits your budget and go from there. Your options are endless! Liberty Square is a somewhat controversial area in Budapest. There’s a large Soviet monument that remains, remembering those who died during the liberation of the city from the Nazis. However, it sits right next to the American embassy. 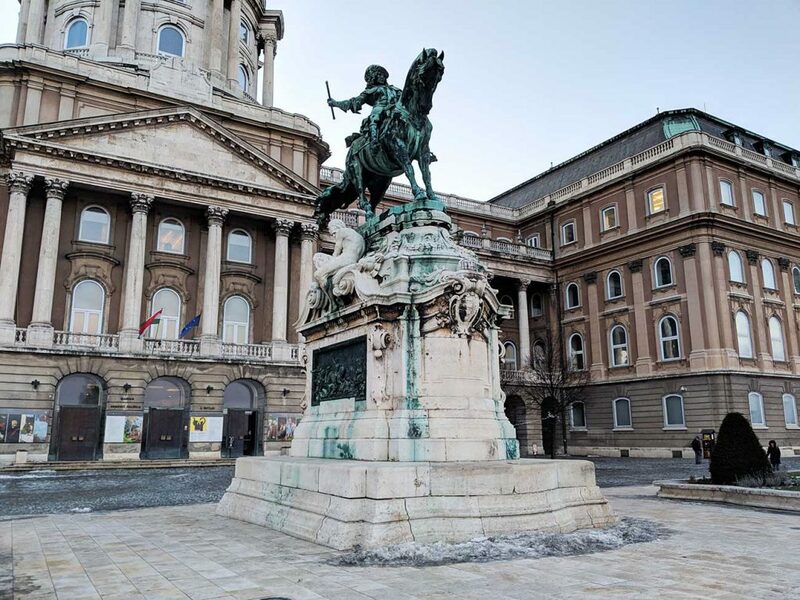 The story goes that Hungary allowed Russia to choose one statue or monument to remain standing in Budapest and they chose this one to keep an eye on the Americans (or to give them the finger). 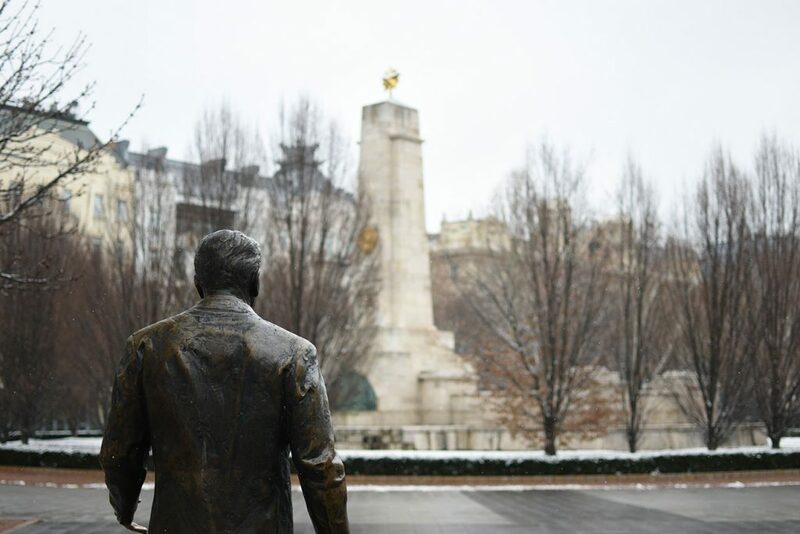 However, there’s now a statue of Ronald Reagan looking directly at the memorial as a rebuttal. 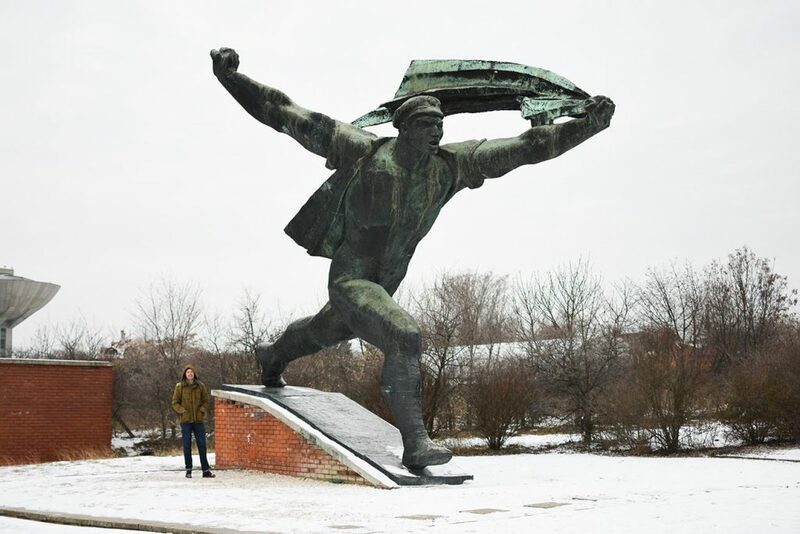 Take the communism free walking tour and have it explained to you in person by a local who grew up in communist times. You will not regret it! All the politics aside, Liberty Square is beautiful. Many locals were there walking their dogs or just out for a stroll. Even in January, Liberty Square is quite charming. This list seems lengthy but we barely scratched the surface of all the things to do. Catch an opera, ride the Budapest Eye, explore caves, river cruise down the Danube, the list goes on. Budapest, Hungary, has been one of our favorite cities in our travels and rightfully so. Hopefully you get to experience the Pearl on the Danube and enjoy all the things there are to do in this wonderful city.